From teeth to tail, the alligator is one remarkable reptile. ​​​​​​​​​​​​​​​The fearsome mouth full of teeth above belongs to an American alligator. This mouth means business, you can be sure. A big alligator bites down with nearly 20 times more force than a person does. Its powerful jaws can crush a turtle’s hard shell in one snap. An alligator has about 80 teeth. When one tooth wears out or falls out, another grows in. That adds up to as many as 3,000 teeth in a gator’s lifetime! A gator can sprint on land as fast as a person for a short distance. And it can grow to be a whopping 14 feet long and weigh up to 1,000 pounds! But gators often seem a lot less fierce than the active one shown here. 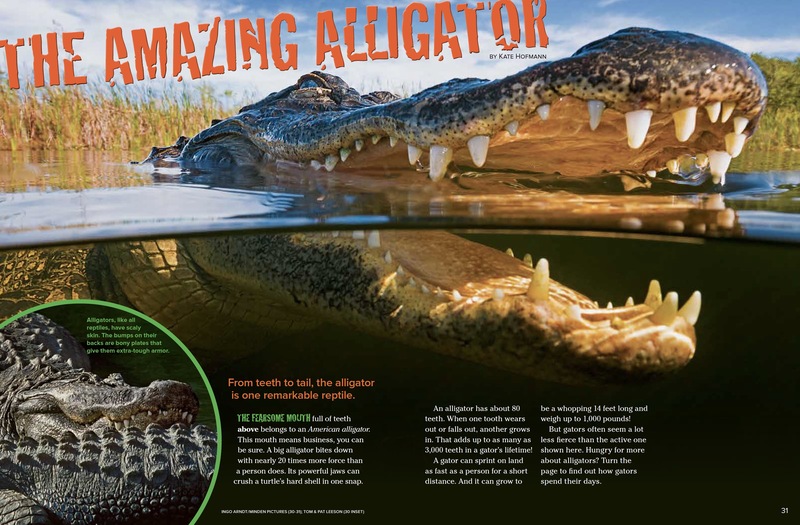 Hungry for more about alligators? 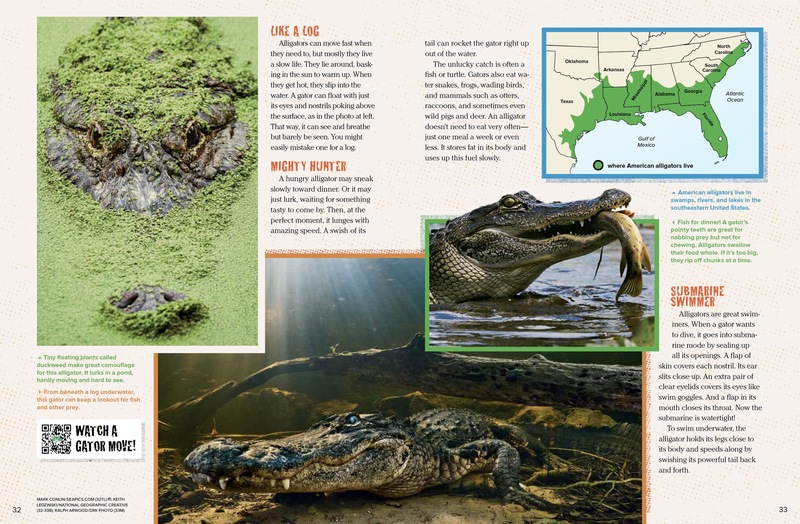 Keep reading to find out how gators spend their days. Alligators can move fast when they need to, but mostly they live a slow life. They lie around, basking in the sun to warm up. When they get hot, they slip into the water. A gator can float with just its eyes and nostrils poking above the surface, as in the photo at left. That way, it can see and breathe but barely be seen. You might easily mistake one for a log. A hungry alligator may sneak slowly toward dinner. Or it may just lurk, waiting for something tasty to come by. Then, at the perfect moment, it lunges with amazing speed. A swish of its tail can rocket the gator right up out of the water. The unlucky catch is often a fish or turtle. Gators also eat water snakes, frogs, wading birds, and mammals such as otters, raccoons, and sometimes even wild pigs and deer. An alligator doesn’t need to eat very often—just one meal a week or even less. It stores fat in its body and uses up this fuel slowly. Alligators are great swimmers. When a gator wants to dive, it goes into submarine mode by sealing up all its openings. A flap of skin covers each nostril. Its ear slits close up. An extra pair of clear eyelids covers its eyes like swim goggles. And a flap in its mouth closes its throat. Now the submarine is watertight! To swim underwater, the alligator holds its legs close to its body and speeds along by swishing its powerful tail back and forth. In the spring, American alligators get together to mate. Males make deep bellowing sounds to defend their territories and attract females. After mating, a female lays 35 to 50 eggs in a nest she builds of soil and plants. Many reptiles lay eggs and leave, but an alligator mom stays to protect her nest. When the babies hatch, she helps them dig their way out. Mom guards her new little gators from their many enemies. Camouflage also helps—yellow stripes on their backs blend in with swamp grass and patches of sunlight. Even so, nine out of ten will be eaten before their first birthday. Otters, bobcats, large birds, raccoons, snakes, turtles, fish, and even other alligators all gobble up baby gators. As gators grow larger, though, fewer and fewer predators are a danger. Once an alligator reaches about six feet in length, it mostly has to fear only bigger gators—and people. People used to kill many American alligators for meat and for their skin (to make purses, shoes, belts, and other things). In the 1960s, a lot fewer gators were left, so alligator-hunting was banned to save them. By the end of the 1980s, gators had made a great recovery. Now there are so many that they can be hunted again. But there are also so many that they cross paths with people more often than before. Alligators have turned up on golf courses, in yards, and even in swimming pools! Alligators usually avoid people if they can. And it’s always best for people to avoid alligators. Most important, people should never feed gators. Alligators that link people with food lose their fear and become much more dangerous. They may even have to be trapped and removed to protect people. 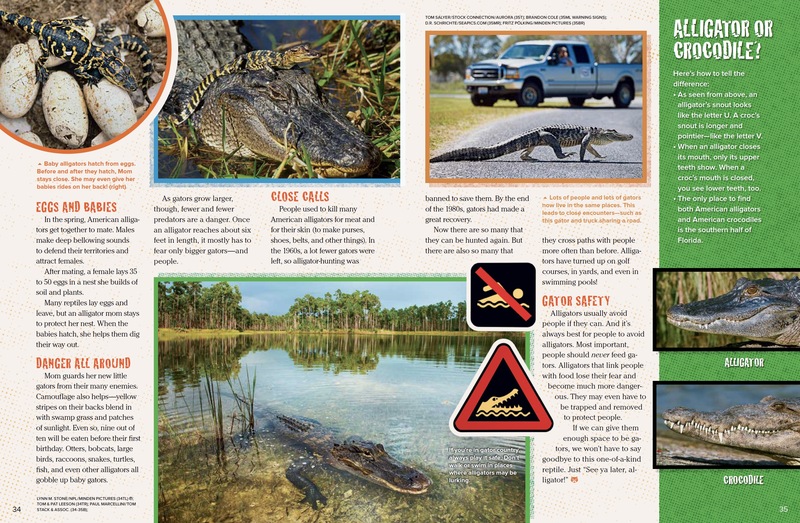 “The Amazing Alligator” originally appeared in the September 2017 issue of Ranger Rick magazine.